It might be a byword for 'safe' or 'modest' but Honda's Civic is more than just another Japanese hatch – there's also the performance variant. Recent years have seen the hottest of the Civic hatches brought under the Type R brand umbrella. Despite past accusations of being a little too raw, this latest model promises to better balance serious performance with everyday refinement. For all the times one of its cars has performed faultlessly, there are as many critics prepared to castigate Honda for producing safe, dependable and unexciting cars. Dependable it may be, but there's more to this generation Civic than meets the eye, and it goes far beyond the car's radical styling. This Civic is proof that the company is serious about attracting younger buyers in a bid to move away from the 'Tartan rug' set. The performance Type R variant of the past is a perfect example of this direction, but critics have accused it of being too harsh and unforgiving. 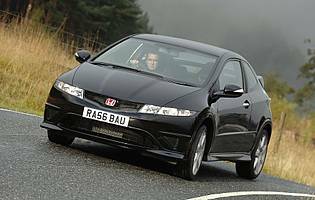 In a bid to broaden the Type R's appeal, this Civic three-door – based on the already more sporting Type S three-door – boasts more creature comforts and fractionally less harsh suspension settings than before. The result is a car that is still quick, but one that offers a clever balance of performance and comfort. You'll be able to make long motorway journeys without feeling jaded and bouncing around town thanks to unforgiving suspension is promised to be a thing of the past. However, when you do want to have fun, the Type R doesn't disappoint. It's not the most powerful in its class, but there's still much to be had from extending the car's high-revving engine to the maximum. Grip levels are high and, unlike its predecessor, this version boasts steering with a decent amount of feedback. The car's exterior might be a big departure for Honda, but in Type R guise the radical looks actually suit the car's personality. It's not all about looks, though. Underneath the Civic's space age body is an impressive engine plus suspension that delivers a balance that few rivals have managed to perfect. Although a proper screamer and tarmac hooligan one minute, the Type R can also 'do' sensible. This Civic has matured into an impressive hot hatch, but don't think that for one moment it's lost any of its magic. Save for the base variant, which is pitched at the serious enthusiast, the Type R is very well equipped. It stands up well to the competition in value for money terms. With reliability assured thanks to Honda's solid reputation, running costs should be modest save for fuel and insurance – if the buyer is very young. While the three-door Civic might not accommodate a growing family as well as the five-door variant, it shouldn't be dismissed as a failure. Despite being pitched as a sporting hatch the Type R is also a practical one. Oddment space is reasonable thanks to a generously proportioned centre console, glove box and door bins. The boot, which is both deep and wide, boasts a clever hidden compartment where you'd normally find the spare wheel. If you're attracted to the car's exterior it's likely that you're already a convert. If you're a fan of digital instruments you'll warm to it all instantly and, for instance, it makes a lot of sense for the speed display to be within the driver's eyeline. However, the front seat passenger will have to stretch to reach the major ventilation controls – a temperature control is in the door armrest. Also annoying is the inclusion of a starter button – it's really a gimmick. At least the manual gearshift is slick and the handbrake requires little effort to operate. The Civic's spacious cabin ensures that head, leg and elbowroom is never a problem. Rear seat passengers are treated in a similar manner, with no major niggles to report. 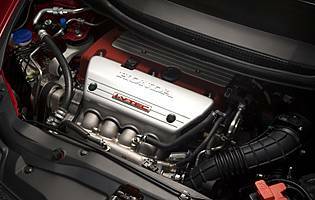 At city speeds the cabin does well to insulate occupants from road and engine noise, an impressive feat considering the fact that the Type R's engine is a vocal unit when revved hard. And on another pleasing note, despite the car's serious sporting character it boast's a surprisingly supple ride. More obviously a sporting car to even the casual observer, the Type R will likely be a target. As such you're not short of security features. An immobiliser, deadlocks, remote central locking and a lockable glove box are standard across the range – although curiously the latter only with the GT. Thankfully a Category One alarm is standard across the range. No expense has been spared with the Civic's safety provision. Twin front and side airbags come standard, along with anti lock brakes, electronic stability control and brake assist. Isofix mounting points are also present, although curtain airbags are only standard on the high-spec GT variant. For some the standard Civic hasn't provided the thrills they had expected. Not so the Type R, which thanks to a fantastic 2.0-litre engine, sporty suspension settings, a slick gearshift and powerful brakes is easily the measure of its rivals. Famously able to rev to ridiculous heights, the engine is gutsy and tuneful, while there's plenty of grip in the wet and dry from this front-wheel drive hatch. For a fully electric system, the steering is pleasingly direct and communicative. Most rivals have this Civic beat in outright power terms, but on the track or road the Type R delivers a better balance than many. To extract the best from the car you need to work the engine, but this far from a hardship. And away from such thrills the Civic is refined and composed both around town and on the motorway. It might lack two rear doors, but the Type R would make a reasonable choice for a growing family. Granted the car's seating arrangement is fixed unlike with a people carrier, but access to the rear isn't that bad and the boot is a good size. You will likely grow out of it and need something bigger, but it will be a fun family hatch while it's around. A regular Civic might be a good idea but the Type R is a different proposition. Fast, thirsty and likely to be expensive for a novice to insure, it wouldn't be a sensible choice. A genuine step forward over its solid predecessor, this Civic is yet another top notch product from Honda. Fit and finish inside and out is exemplary and the choice of materials used to trim the cabin well above the class average. This car's radical exterior is a mechanism for Honda to chase a younger audience, and the Type S three-door model proves an ideal building block for the Type R, which already has a burgeoning fanbase all of its own. Wide opening doors plus a slightly elevated front seating position make access and egress straightforward. However, anyone wider than the average will find the Type R's sports seats snug to say the least. Access to the rear seats is also good, although predictably it's easier to get in than out. Standard is a combined bespoke fit radio and single CD unit, with remote audio controls conveniently on the steering wheel. Sound quality is good, and there's the option of a full-house DVD-based sat-nav unit complete with a Bluetooth handsfree phone and voice recognition for the major commands. It all works well but is a little pricey in comparison with separate aftermarket offerings. Choose light exterior colours if you don't want to lose the Civic's interesting details. The cabin boasts an Audi-like ambience, but with more character. There are generous doses of high quality black plastic, but being the Type R the contrasting upholstery colours are a welcome inclusion. There's no problem with forward visibility, thanks in part to a slightly raised driving position and the car's responsive power steering. Rearward vision is not so good thanks to the rear window's lack of a wiper when driving in wet conditions. A racy spoiler placed halfway up the screen doesn't help matters either. Thankfully the car's side mirrors are a generous size. Tyre foam kit and compressor included in lieu of a conventional (optional) space saver wheel. Petrol engines: 1.8-litre (140bhp); 2.0-litre (200bhp). Diesel engine: 2.2 i-CDTi (140bhp). Standard issue is a six-speed manual gearbox across the range. Trim levels for three door Type S: base, GT. 2.0 Type R (three-door only): base, GT.